an important new publication for our members! Men of the West, Women From the East represents the culmination of nearly two years of effort to produce an E-Book worthy of RWD and our distinction of being the largest and very best internet site serving our niche. 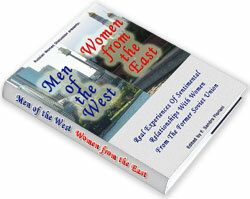 Men of the West, Women From the East is also the most comprehensive, the most informative and the most up-to-date resource available on this topic. I will be forwarding each of you a complimentary copy of the E-book in the next few days - with our sincere appreciation. And while at it - we need to offer a VERY SPECIAL note of appreciation to Sandro, the Editor of the entire work. Sandro has been diligent in pushing this E-book through to completion over these many months, and has applied creativity and intelligence, both of which Sandro has in abundance. Without his efforts, this E-book would have never materialized, and his contributions cannot be overlooked. 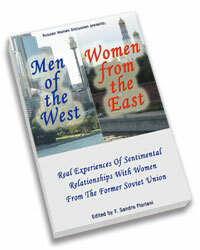 Men of the West, Women From the East is offered as of 01 Feb 2012 as a free download - see posts below. Please feel free to let us know of any and all problems or inconveniences you encounter. We sincerely believe you will find this E-book extremely valuable in your pursuit and welcome your feedback. To those who deserve it, good luck. Bravo to the participants individually, Sandro for his diligence and the site management for the willingness to take a bold step in a different direction. It's a shame that it's only available as a Windows download. My 2 PCs are Linux and Apple OSX. It's a shame that it's only available as a Windows download. My 2 PCs are Linux and Apple OSX. 55North, IINM Wine (http://www.winehq.org/) is a Windows emulator that one can install on both Opsys. Many thanks. I'll give that a go later. Please let us know the result, if successful we might want to add a note to the product pages for those in your same situation . This eBook is very well done! I love the navigation. Being able to move through the topics and click on the links to read the supporting strings was a nice touch. I did have to turn off my firewall when first installing it, but once it did, it was great every time after that. I hope you sell thousands and continue to get the word out. I don't know what your firewall is, but it's normal for any firewall to object to an EXE trying to access the Internet - spyware/malware often does that. Usually this is manifested by a warning pop-up that offers the choices of allowing or blocking the offender, the first permitting all subsequent attempts by the same EXE without further hindrance. I think this is what you mean by 'turning off' your firewall . We recently made the decision to offer the RWD E-Book, Men of the West - Women From the East, available to our members as a free download. This E-Book was the result of many months of effort involving a number of our members and drawing on the collective wisdom and insights contributed by thousands of participants over nearly a decade. Taking this wealth of information and weaving it together into a coherent and legible format that readers will find enjoyable was the work of our master linguist, SANDRO43. "MOTW.exe is not a valid Win32 application"
I get the following error when trying to run: "MOTW.exe is not a valid Win32 application"
Odd . What flavour of WIN are you running? Does anyone have an idea as to how to run an .exe on a mac OSX without running a separate Windows platform? Surely there is a free quick loadable software or can the book be converted to a different download? With all due respect, Dan... you have a great forum and I love reading it... and I'd like to take a look at your book... but this choice of format seems odd. Thanks for the comments about RWD. As for the E-Book format, I do not recall the specifics of the back-and-forth that went into selection of the software and ensuing format - though I recall it took us a while (a long while) to settle on the final choice. We eventually selected a commercial software product called Activ E-Book (here is their home page -- www.ebookcompiler.com) after having considered numerous other options. While the book downloads as a .exe file (and that seems to raise security questions with some of the current OS's), there is nothing to be alarmed by. If you manage to open the file, you will see what I mean. The viewer looks like a simple web page, hence, it should be familiar to everyone. The navigation controls take a small amount of time to become familiar, but are quite intuitive and the viewing/reading experience is quite pleasant. There is no lag as can be found in some viewers, and the formatting, colors and presentation were masterfully assembled by Sandro and his team. One word of caution - as with anything Sandro writes professionally, his word choice and text construction is dense. That is to say, he is world-class at densely packing a huge amount of information into a very small amount of space/text. Once again, take a look when you are able and you will see what I mean. Sandro is, quite simply, amazing at what he does. The E-Book itself is packed with useful information. Seven (7) chapters, each with several subchapters, and more than a dozen Appendices - all containing a wealth of relevant information quite helpful to people in this pursuit. I hope you get the chance to look it over. The primary reason we elected to offer it free of charge is to ensure it reaches a broader audience. I agree with the others regarding the format. You've published this is a closed format, rather than something relatively open like PDF, which can do pretty much everything I see in this guide without limiting what platform you can view it on. If the intention is to reach the widest possible audience then it makes sense to publish this in a ubiquitous format like PDF, since there is a PDF viewer for almost every platform in existence. I have thousands of e-books that I have purchased and downloaded for free, they are all PDF, except this one. My search was going so well, then life intervened... but I'm back! Dan, I think it would be useful to set up a separate thread for comments and suggestions for changes regarding the content of the book, as opposed to the access etc. that is mainly discussed in this thread. A very good source and I applaud those who have participated in the forming the book, but I was very bothered by some sections and words which I think are misleading to 'newbies' which should be the primary readers. Dan, I'm sure you and your associates will be able to figure out how to solve this issue and making it an easy download process. But I wanted to take the time and to thank you, Sandro, and those who helped you with this fine publication for allowing this book to the masses, to the public. A great guide for helping to steer new guy's in the right direction. We invite discussion and debate (civil, of course) directed at the content of the E-Book. Maybe you could begin the topic(s)? It matters not at all to me whether it is here, in this forum, or in one (or more, if appropo) of the regular forums below. If you see something you wish to make comment on - please feel free. As you know, PDF is a product of Adobe Publisher. We looked at compilers that produced PDF output and found none that offered the features we were looking for at the time. I have no idea of the total number of pages in the current E-Book, but it is substantial. I suppose I could construct a PDF version by simply 'printing' each 'page' (one must remember, on the internet a 'page' is not the same as a 'page' in an old-fashioned hardcopy book form) into a PDF and then assembling those into one single document. It would then be portable to other platforms, at a significant loss of ease for the reader. BTW kudos on the actual content and to everyone who contributed, its a great resource and good read! The file will not run on Windows XP. Even tried it in a DOS window. If anyone can convert it to an XP valid file, would appreciate a copy. The properties of the .exe file I downloaded is only about 209 KB. Is it possible that the full file is this small? The file will not run on Windows XP.